It snowed ALL NIGHT last night here in Anchorage! We got about a foot of snow, and it’s STILL SNOWING!! Until a few days ago, I’d been cross-country skiing on the Hillside trails, and due to our meager snow cover, I’d quickly made a pair of rock skis out of my best pair of skis. (They are six years old, though…) *sigh* I know what will be on my Christmas list this year! Anyway, according to my brother, Ben (the manager of Alaska Mountaineering and Hiking), it’s high time I updated my gear from the Pleistocene era. He says that I should try the latest technology… skinnier tips, less shaping in the middle (or is that wider tips and more shaping in the middle?). So after a leisurely Sunday breakfast (Meredith helped her dad make pancakes), Dan and I discussed the day. We decided that I would have the first ski shift. (We trade off with Meredith when we both want to ski solo.) He and Meredith would plow the driveway and our road up to the top of the hill, then I would scoot out in our little front-wheel-drive Jetta station wagon and zip over to Hillside for a slow and lovely trample around the trails. I got dressed and set off, my windshield wipers flailing at the thick clouds of snowflakes already obscuring Dan’s plow swath. My trusty little Jetta made it up the hill—and in fact, although none of the roads were plowed except for Dan’s handiwork, I made it the three miles to the trailhead at the high school. At which point, my little car plowed uphill into the huge berm of snow across the entrance to the parking lot and got firmly stuck. Whoops! I tried backing out, into the relatively clear main road, but I was completely high-centered! While my Jetta has great traction, it doesn’t have very high clearance. So I spent the next half hour on my belly, wishing I’d brought a shovel, burrowing packed snow out from under my car with my gloved hands. I managed to back the car out in stages, foot by foot. When I was about four feet from the road, two nice guys from the nearby sledding hill walked over and shoved me the rest of the way out. Thank you!! I anxiously drove right home, luckily without incident, passing several cars embedded in their own snowdrifts, and zipped back into the garage. SAFE! Dan and Meredith, by this time making a snowman, were surprised to see me home so soon, but I soon re-emerged from the house with my gear. I popped my skis on, strapped on my poles, and skied off up the driveway! I had a gorgeous slog/ski on the bike trail through my neighborhood, and all the way back to the Hillside trails, where I did a short loop and then trudged my slow and snowy way back! Here’s what I ate for lunch when I got home! It’s the perfect warming meal for a snowy day. This tomato soup is a revelation: it’s yummy, creamy and rich without any cream or butter in it! It’s based on a recipe in Peter Berley’s book The Flexitarian Table . I think it makes a difference to use really good canned tomatoes and tomato paste, and I like Muir Glen. Another reason I love this recipe is because I can use gobs of local Alaskan carrots and onions! For a meal, serve this soup with any kind of a simple green vegetable or savory salad. I like to make a double batch and then freeze the extras for a fast meal later, when I’m cold and hungry! You can just toast the bread in the toaster for the croutons, and cut it into cubes (that’s what I did today! ), or you can get fancy and make the garlicky croutons if you aren’t already starving-hungry, and can wait 20 minutes for them to toast in the oven. 1. I slice the onions and carrots in the food processor—this is especially time-saving if you’re doing a double batch of soup. Just cut off the stem end of the carrots and push them down through the narrow feed tube, pushing with the pusher cup. 2. In a heavy pot, heat the oil over medium-high heat. Add the onions and ½ teaspoon salt and cook, stirring, until the onions have softened—5 minutes or so. Add the garlic cloves, carrots, and pepper flakes, lower the heat, cover, and cook until the vegetables are sweet and juicy and tender, but not browned, 20 minutes or so. Check and stir occasionally, adding a few tablespoons of water if the vegetables are dry. 3. Add the tomato paste and cook, stirring, until well combined, about 2 minutes. Add the tomatoes with their juice, the stock or water, orange zest and sage and bring to a boil, then reduce the heat and simmer for 15 minutes. 4. Remove the pot from the heat and discard the orange zest. Puree the soup with an immersion blender, or in batches in a blender. It’s easiest to do this if you’ve let the soup cool for a while first. Season with salt if you like, but I didn’t find it necessary because of the salt already added to the onions and in the canned tomatoes. Reheat the soup before serving, and add water to thin the soup if it seems too thick. 5. Ladle the soup into bowls, sprinkle with croutons, and serve. What’s the most important consideration on Thanksgiving Day? I mean aside from the attention to what we’re thankful for, counting our blessings, and all that… Once our contributions to the feast have been duly baked, sautéed, roasted, and steamed, it’s time to make the single-most important decision that will make or break your Thanksgiving dinner. What will you wear? I used to advocate for elastic waistbands. An elastic waist on your pants or skirt ensures that no matter how many wonderful, home-made, once-a-year fabulously traditional savory and sweet delights you consume, you will still fit in your garment (no need to unbutton or unzip). However, the elastic band has an unfortunate tendency to become rather tighter as the evening proceeds; an unwelcome reminder that perhaps you have overindulged. Much better to adopt my latest paradigm: no waist at all! (See photos, below, of Meredith and I, dressed in our waist-less best for the festivities!) Meeting the no-waist criterion is probably the easiest for the younger set—how I wish I could find some of Meredith’s getups in my size—but still, with a little persistence, I’m sure you can find something that won’t look too frumpy, but will be extremely comfortable for your holiday gastronomic adventures. What I’ve found is that these sorts of dresses aren’t ever terribly unfashionable, because they were never fashionable to begin with. Perfect! And our dear friends, the Nelson’s, family friends since I was a small child, would certainly never bring up the fact that I wear this same dress, year after year. Hopefully your crowd is equally forgiving! This probably won’t help you men out there. The best I can recommend is that you wear your pants with the roomiest waistband. But don’t wear a belt—buy yourself a pair of suspenders! My husband, Dan, tried to think of a waistless item in his wardrobe, and the best he could come up with was his rubber overall rainpants with the built-in suspenders. I might have humored him, but they are florescent orange. This stuffed squash recipe is based on one from Annie Somerville’s Fields of Greens , one of my favorite books for soups and salads and vegetable dishes. 1. Preheat the oven to 375 degrees. Rinse the squash, cut them in half lengthwise, and scoop out the seeds. Brush the flesh with olive oil and place the squash halves cavity side down on a baking sheet. 2. Bake for about 20 minutes, until just barely tender. (The squash will finish cooking after it’s filled.) Remove the squash from the oven, turn it cavity side up, and sprinkle lightly with salt and pepper. While the squash is baking, prepare the filling. 1. In a small bowl, combine the golden raisins and currants; cover them with boiling water and set aside to plump. 2. Bring 1 ½ quarts of water to boil in a medium-sized saucepan. When it boils, add ½ teaspoon salt and the wild rice. Lower the heat to a gentle boil; cover and cook until the grains are tender but still chewy, about 30 to 35 minutes. Drain the rice. 3. Meanwhile, heat the olive oil in a sauté pan; add the onions and ½ teaspoon salt. Saute over medium heat until the onions are soft, about 5 minutes, then add the fennel and/or celery and the crushed fennel seeds. Saute the fennel and/or celery for about 5 minutes, until it’s starting to soften, then add the garlic. Saute for a minute or two longer, then add the wine and simmer until the pan is nearly dry and the fennel/celery is tender. 4. In a medium-sized bowl, toss the rice with the sautéed onions and fennel; drain the fruit and add it to the rice mixture, along with the pine nuts, orange zest and juice and season with salt and pepper to taste. The filling should be very well seasoned. 5. Divide the filling among the squash halves and place in a baking dish with ¼ inch of water in the bottom. Cover with foil and bake until the filled squash is hot and steamy, about 30 to 40 minutes. 6. Serve hot or warm. These make fantastic leftovers, too, heated in the microwave. This salad is wonderful with any kind of Mexican dinner, but it’s perfect alongside the enchiladas filled with braised greens and garlic-roasted potatoes. Fresh and crunchy, it makes a perfect contrast to the rich flavors and soft textures of the enchiladas. Of course I used Alaskan cabbage! This recipe is based on one in Vegetarian Suppers from Deborah Madison’s Kitchen . It’s fine even the next day as leftovers—it just gets to be more like cabbage pickles. Tip: in case you like to make things occasionally with lime juice (like guacamole, or this recipe, for example) but you don’t always have limes hanging around, you can buy a big bag of them from Costco, squeeze them right away, and freeze the juice in small containers. Then you can just pop a container in the microwave for a few seconds when you need some fresh lime juice. Toss the cabbage with the salt and onion and sugar. Add the rest of the salad ingredients, toss well, and taste carefully. Does it need more sugar? More salt? More lime? Add until you’re happy with the flavors. It should be bright and pickle-y, not bland. Refrigerate until ready to use. Alaskan enchiladas? Does that sound like an oxymoron? Well, ever since our friends Arthur and Michelle made us enchiladas a few weeks ago, I’ve had a terrible craving for MORE enchiladas. Their enchiladas were filled with spiced Alaskan ground buffalo and yummy homemade refried black beans—they were fantastic! While I didn’t have any buffalo, I figured that the bounty of Alaska would provide enough for more than one enchilada variation! Determined to feed my enchilada hankering, I rummaged around in my pantry and scrutinized my favorite cookbooks for inspiration. Ziploc bags of sliced and par-boiled collard greens line one section of my chest freezer, and I’ve got boxes full of potatoes and onions in the garage. I even have some Alaskan cheese that we use for our Alaskan cheese & roasted garlic bread! I came across several good recipes, including some for homemade enchilada sauce (one of my requirements). This recipe is a hybrid of many of these recipes, but the filing is most directly inspired by one in Veganomicon , and the sauce is a variation on one from Rebar: Modern Food Cookbook . Our friends Chuck and Laurie came over with their kids to share these enchiladas. Since I’d made all the components ahead of time, I chatted happily with Laurie while I rolled the enchiladas. Meanwhile, the kids were busy rehearsing a new musical play, complete with capes, crowns, swords and buried treasure. (The dads hid upstairs, playing guitar until dinnertime). At dinner, we managed to devour quite a few, washed down with pints of locally-brewed Midnight Sun beer. YUM! These are fun to make, for sure—but unless you make the components ahead of time (that works great!) it’s not really a quick and easy, after-work kind of meal. But each of the components is simple, and you can do the prep the day or morning beforehand, and then just assemble and bake the enchiladas right before dinner. Also, if you make double batches, you can bake them and then freeze the enchiladas for re-heating later—or you can just freeze the components for rolling more enchiladas in the future! I invented this recipe with a little inspiration from Veganomicon , but the enchilada sauce is a variation on one from Rebar: Modern Food Cookbook . I served it with my fresh cabbage and lime salad. Luckily, my four-year-old Meredith likes braised collards, but in case you are feeding some people who might be skeptical of the greens, you can make one dish of enchiladas without the greens. 1. Make the enchilada sauce first, so it has time to simmer and then cool a little before you roll them all together. 2. While the sauce simmers, chop the potatoes and get them in the oven. 3. While the potatoes roast, chop the onions and then braise the greens. 4. Put the enchiladas together and bake them! The ancho chile powder is different than regular chili powder; ancho chile powder is nothing but ground up ancho chiles. The chili powder you’re likely to find at the grocery store is basically a spice mix of cumin, chile, garlic, salt, and other things. I don’t know how this recipe would work with regular chili powder, but you can find the ancho chile powder at Summit Spice & Tea Co. (1120 E. Huffman Road, #4). They have great spices and herbs of all kinds—you can pick up your cumin, cayenne, oregano, and sea salt there, too! For the masa harina (corn flour used for making tortillas), look in the Mexican section of most grocery stores. I found it at Fred Meyer. 1. Saute the onions in the oil with 1 teaspoon salt over medium-high heat until golden-brown. Add garlic and cook 3 more minutes. Sprinkle in the masa harina, spices, and oregano, and stir until everything has a chance to toast a little bit. If you’re worried that it’s starting to burn, go ahead and add the liquid. 2. Whisk in the stock or water and bring to a boil. Reduce to a simmer and whisk in the tomato paste and sugar. Taste it, and add more salt and sugar to taste. It might not taste very good at first, especially because it will probably need a bit more salt and sugar, but don’t worry, it will taste better and better as it simmers. 3. Simmer partially covered for 30 minutes, stirring regularly. 4. If you want a smooth sauce, let it cool a bit and puree it, either with an immersion blender, or very carefully in a blender. Otherwise, just leave it as is. 2. Preheat the oven to 400 degrees. Cut the potatoes into ½-inch pieces. Toss them in a bowl with a few spoonfuls of garlic oil, then sprinkle with ½ teaspoon of salt. Toss again. 3. Lightly oil a large baking dish or sheet pan, and transfer the potatoes onto it. 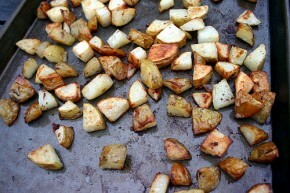 Roast the potatoes until tender and browned, 25 to 40 minutes. The time will depend on how many sheets of potatoes you do at once, and how you’re your oven reheats. Just stir the potatoes around with a spatula when you check on them, and keep roasting until they are done to your liking. 1. Plunge the kale or collards into a large pot of boiling salted water, and cook until tender. This could take as long as 10 minutes, but could be much shorter, depending on the age or toughness of the greens. Start tasting after 5 minutes, and cook until tender. (Boiling in salted water pre-cooks the greens and removes bitterness.) Reserve one cup of the cooking water. 2. Drain the greens in a colander. 3. Heat the olive oil and sauté the onions with a teaspoon of salt until lightly browned. Add the garlic and cumin and sauté for another couple of minutes. Add the greens and the reserved cooking water (or use a cup of vegetable broth or bean-cooking liquid). Cook for 15 to 30 minutes on low heat until they are lovely, soft and sweet, and taste again for salt. They can really use a lot of salt, so don’t be shy about adding it until it tastes nice and seasoned. 1. Preheat the oven to 375 degrees and coat the bottom of a large (9 x 13”) baking dish with a spoonful of the enchilada sauce. 2. Ladle a cup of enchilada sauce into a pie dish and if the sauce is quite thick, add a little warm water to make it the consistency of heavy cream. Heat the tortillas up a bit, so they are pliable. You can do this one at a time on a hot skillet, flipping from time to time, or just microwave several on a plate. Drop the softened tortilla into the pie plate filled with sauce, cover it completely with sauce, then flip it over and coat the other side. 3. Place the tortilla in the casserole dish and run a scoop of greens down the center. Top with a scoop of roasted potatoes, and if you’re using cheese, sprinkle a little on top. Roll the tortilla up and place it seam side down in the dish. Continue with the rest of the tortillas, tightly packing the enchiladas next to each other so they don’t come unrolled. Pour a cup or more of the sauce (the sauce that you haven’t watered down—the thick stuff!) on the top of the enchiladas, sprinkle with a little cheese if you’re using it, and cover tightly with aluminum foil. Bake for 25 minutes. Remove the foil and bake for another 10 to 15 minutes, until the cheese is melted and the edges of the tortillas look a little browned. Let sit for 5 minutes or so before serving. Sometimes I write stories about cooking and eating local food that also get posted on the Green Fork Blog, which is an arm of the Eat Well Guide. The Eat Well Guide is a spiffy website that helps you find wholesome, fresh, sustainable food wherever you are in the U.S. or Canada! Anyway, my friend Leslie, at the Eat Well Guide, emailed me to let me know that they are presenting a Thanksgiving Local and Organic Food Challenge. They want everyone to visit the Eat Well Guide, find a local farm or market, and serve up at least one dish with local ingredients for their Thanksgiving feast. Then, we’re invited to post our recipes and experiences. I wrote back to Leslie, “Right! I guess lots of farmers’ markets farther south will still be open!” Here in Alaska, it’s easy to forget that not everyone’s farm fields are covered in a nice thick blanket of snow, hibernating until spring in sub-freezing temperatures. The last couple of markets at our South Anchorage Farmers’ Market in October are punishing enough—there’s no way the produce or the farmers would last in an outdoor market in late November! Well, that definitely sounds like a challenge to Alaskans, doesn’t it? What Leslie might not know is how many nourishing and savory staples we can store all winter long! Potatoes, carrots, beets, parsnips, red and green cabbages, onions, turnips, and parsley root, to name some! If we’d had a warmer summer, we’d even have hard winter squash! Come on, Alaskans—let’s show our stuff! Whether you log in and share your experiences with the rest of the web-world, or just share your stories with your friends and family over your holiday meal, let’s take the challenge, and be conscious of the local food we can procure, cook, and enjoy together. These wine-braised lentils would be a fantastic vegetarian option for Thanksgiving, especially accompanied by the mashed potatoes and parsley root! I had never tried parsley root until last fall at the farmers’ market, when I bought some from Rempel Family Farms. Mashing the parsley root with russet potatoes made the richest, most delectable and delicious mashed potatoes I’ve EVER eaten—and all that without a smidgen of butter, milk, or cream! Just using the stock from cooking the vegetables works really well instead of milk or cream, because it’s so flavorful from the parsley root! Just season to taste with salt and pepper—the vegetables have lots of flavor all on their own. But of course, you can gild the lily if you like, and add butter, milk, or cream. As you wish! This recipe is based on one in Deborah Madison’s Local Flavors . 1. Peel the parsley roots. Scrub the potatoes, and decide whether you want skins in your mash or not. I like to leave the potato skins on, but if you want a perfectly smooth puree, definitely peel them first. Coarsely chop the vegetables and put them in a saucepan, cover with water, and add 1 teaspoon salt. Bring to a boil, then simmer until the vegetables are tender (15 to 20 minutes). Scoop the potatoes and parsley roots out (or strain them in a colander), but MAKE SURE TO RESERVE THE COOKING LIQUID! 2. Return the vegetables to the pan and mash them, using the reserved cooking liquid to thin and loosen the mixture as needed. When smooth, add salt and pepper to taste. 3. Serve right away with your favorite stew or gravy… I’d suggest the wine-braised lentils! 1. Parboil the lentils for 5 minutes in abundant water, then drain. 2. Heat olive oil in a large saucepan or soup pot. Add the diced vegetables and cook over medium-high heat for several minutes, browning them a bit. Add the garlic, mash the tomato paste into the vegetables, then pour in the wine and stir in the mustard. Add 3 cups water, the drained lentils, and 2 teaspoons salt. Simmer, covered, until the lentils are tender, 30 to 40 minutes. Add more water, to your taste, depending on how soupy you’d like them to be. 3. Serve with mashed potatoes (or mashed potatoes with parsley root), and sprinkle the parsley over all. Seems like it’s been ages since I’ve had any spare time to write a blog post. My latest big adventure: I’ve just launched a new business with my farmer friend, Arthur! It’s called Glacier Valley Farm CSA, and it’s a year-round Community-Supported Agriculture program based here in Alaska! While the last few weeks have been incredibly busy and stressful, I’m digging out from my mountain of tasks with a new appreciation for the kindness of people. So, about the new business: Arthur and I decided we needed to step up to the plate and provide a local alternative to the wildly popular produce boxes shipped up from Washington State. We’re using Alaskan produce, grown by several farmers in the Matanuska Valley, just north of Anchorage, as the foundation of our box contents, but in the wintertime, we’re adding certified organic produce from Outside to add variety to our nourishing Alaskan staples: cabbage, potatoes, carrots, beets, turnips, and onions. So, Arthur grows vegetables and fruit, procures all the other produce, fills the boxes, and delivers them all around town. I get to help plan what goes in the boxes, write the recipes and the weekly newsletter that goes into the box, maintain the website, and answer customer service questions as people order and pay for their boxes online. And my husband Dan does the paperwork and book-keeping! Starting all this up has kept us pretty busy! And here’s another thing—using the internet to order anything, let alone paying with a credit card via PayPal, is something that a lot of my customers aren’t familiar with. But they gamely gave it a try, and if they had troubles, patiently followed along with my step-by-step instructions over the phone. I’m so grateful for my customers’ patience, understanding and support through these first bumpy weeks. It has made all the difference, and makes all our hard work worthwhile. I guess I always thought that people were basically good, but now I know it to be true. And thank goodness, too, that this week, our website is running like a well-oiled machine! So smoothly, in fact, that I’ve had a little time to cook something! A nice change from thawing out frozen soups that I made from last summer’s bounty, or for counting on Dan to cook our meals! So I made an old favorite: my warm red cabbage salad. It’s comforting, tried-and-true, easy to make, and I didn’t have to go to the store for any ingredients. Need more reasons to make it? It’s beautiful and colorful on your plate, and the combination of savory flavors from the cabbage and balsamic vinegar, richness from the salted walnuts, and sweetness from the apples are really wonderful. It was one of the recipes in last week’s Glacier Grist (the weekly newsletter that goes into the produce boxes). This dish is fabulous—I make it all the time through the fall and winter, and I never get tired of it. The recipe is based on one in Deborah Madison’s The Greens Cookbook . Even if you’re not a diehard cabbage fan, this recipe may well convert you. The cabbage can be as soft or as tender-crisp as you like—I usually cook it until it’s fairly tender, but make it to your liking. I have been known to make a huge vat of this for parties—you can make it in the afternoon, before dinner, and warm it up in the microwave and then sprinkle on the nuts, parsley, and optional cheese at the last minute. 1. Preheat the oven to 350 degrees. Toss the walnuts with the walnut oil and some salt and pepper and toast in the oven for 7-10 minutes, until the nuts are toasted and fragrant. Remove them from the oven and let them cool. 2. Quarter the cabbage, remove the core, and slice it thinly. 3. Core the apple and slice it thinly. 4. Put the garlic, vinegar, and oil in a wide sauté pan over medium-high heat. As soon as the mixture is bubbling, add the onion and sauté for a couple of minutes. Add the cabbage and continue to cook until wilted, and as tender as you like it. 5. Season with plenty of salt and pepper, and definitely add more vinegar to sharpen the flavors. Don’t be shy with the vinegar and salt—it’s what makes the salad yummy. 6. Add the apple slices and stir for another minute, then remove from the heat. Just before serving, add goat cheese (if using), parsley, and walnuts.